After the last broadcast in July / August 2001, work more or less commenced to raise funds for another broadcast in 2002 immediately. Our community had made it clear the service of music, news, information and Advice is what is wanted. During the broadcast in July / August 2001 we applied for one of the fifteen “Access Radio” trial licenses available from the radio authority to commence in January 2002. There would be fifteen community radio stations selected by the radio authority and given for the first time in this country a twelve months radio-broadcasting license to take part in this unique trial. If the stations taking part in the trial broadcasts are a success, the license might become available to other community stations like GFM. The radio authority stipulate that there can only be restricted service license broadcasts of twenty- eight days maximum, with a minimum of four months in between each broadcast. Our community has made it clear they want more than just twenty-eight days. Although we were not successful in our application for the “Access Radio” license, we were not despondent, this gave us the opportunity to learn from those who had secured a license, and it also gave us the opportunity to develop GFM gradually. It was our intention to do two broadcasts this year and in between each broadcasting on the radio, we would provide training for anyone looking a career in radio broadcasting and also broadcast on the Internet. Sam Copland had kindly offered to do this for us following the last broadcast. The broadcast was to take place from our spiritual home, The Barton & Tredworth Community Resource Centre, Conduit Street, Gloucester. GFM also became members of the Community Media Association, Paul Johnson, Treasurer (aka Tony) and I attended the AGM in London in November 2001. We were excited that the centre was to be refurbished, thus providing a better envoirment for visitors, presenters and everyone involved with GFM to serve the community. From the outset of the refurbishment work we were told the work would be completed by the end of April 2002. To broadcast in July / August 2002. 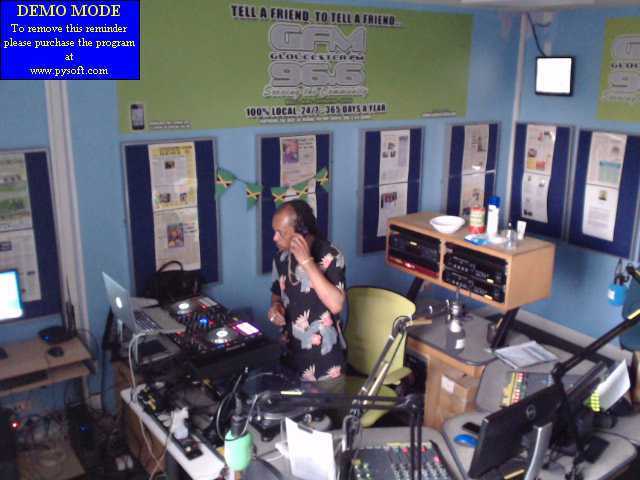 GFM would hopefully once again broadcast to coincide with the Gloucester City Festival and Jamaica’s 40 independence celebrations. In early January 2002, I received a phone call from the radio authority informing me GFM had been granted another 28 day Restricted Service License, However with good news, sometime comes bad. Another radio station had been given our old frequency of 105.6FM, this meant we had to change all our publicity material and make new jingles. Having completed two broadcasts on 105.6 FM this meant a lot of work would have to be done to inform the community of the change. However, having been notified verbally that the frequency would change we could not get written confirmation until sometime in May 2002 what the new frequency would be. We would only have approximately seven week to inform the public of the new frequency and that GFM would be back on air July / August 2002. I approached Liz Artner, the promotion manager, Chelsea Building Society to work in partnership with GFM again. The Chelsea building agreed to support GFM by providing the printed publicity material. Press releases were submitted to the Citizen and the Barton Enterprise newspaper informing the community of the good news, asking for volunteers / presenters to come forward and seek sponsorship to put us back on air. Soon after, John Mustoe, one of our presenters approached me about working in partnership with Sphera Interactive Media to re-design and manage our website in support of GFM. A while after our discussion GFM was also approached to put up a stall and provide back – ground music at Gloucestershire County Council’s Black Worker Network launch on the 28 May at British Energy, Barnwood, Gloucester. Following a meeting with Andrew Clarke and Matthew Collingwood from Sphera Interactive Media it was agreed to work in partnership and re-launch the website to coincide with the Black Workers Network Launch at British Energy. All we needed now was the funds to guarantee the broadcast and training for presenters / volunteers. This again would take an enormous amount of our time. Training for presenters / volunteers needed to be sorted as soon as possible. Unfortunately we could not get a driver to transport trainees to Bristol in 2001. Therefore after meeting with representatives from Glos Cat training was booked to be delivered prior to the broadcast in July / August 2001 by Glos Cat, however from the feedback we received from the presenters who attended the training, we knew it was not what we were expecting. With no one to drive a mini van with the trainee’s to and from Bristol and the problems with the training in 2001, we decided to contact Kevin Philemon at CEED Multi Media Centre, Bristol to discuss the training for this years broadcast and the difficulties we were having with transporting the presenters to and from Bristol each day. During our conversation we agreed to extend the training from three days to five days, Kevin was also willing to travel to Gloucester to deliver the training. GFM would also provide one week of in house training to enable everyone to get familiar with the studio equipment one week before the broadcast leading up to going live on Monday 15 July 2002. In early February I received confirmation GFM had been recommended for SRB6 funding from the Gloucester Challenging Attitudes Partnership. However we did not get a letter confirming the grant until 25 March 2002. GFM had been awarded £10.000.00 grant from SRB6 towards the £20.085.21 required to purchasing the studio and transmitter equipment. There was a shortfall of £10.085. After discussion with the equipment supplier, Soundsense, we agreed to purchase the studio equipment and the aerials for £12. 493.70 It was not practical to keep paying the aerial company to erect and take down the aerials and satellite receiver from the studio and transmission site after each broadcast. We had managed to raise some funds to make up the shortfall to purchase the studio equipment, but we were unable to raise the funds to purchase the transmitter equipment, therefore we had to hire it. However, we did not have sufficient funds to purchase the IT equipment and pay all the fees associated with the broadcast. Tony, Martin Rafferty and I visited the Sound Broadcasting Exhibition at the NEC last year October and was given a demonstration of the Enco Dadpro 32 IT equipment. This was what we were looking for to help GFM improve the service being provided to the community. The cost of the equipment was £19.171.30. Trying to raise the funds for this became a major headache, eventually a bid of £19.171.30 for the IT equipment was submitted on GFM’s behalf by the Barton Tredworth & Eastgate Community Trust. GFM had been working with the Trust in partnership since the first broadcast in October 2000 without a formal partnership agreement. The Trust ” Bank Rolled” GFM to ensure we were able to broadcast when there was a shortfall in the funds required. GFM paid back the Trust after the broadcast from the funds that were not available until after the broadcast. I received confirmation of our frequency 20 May, I informed Liz Artner immediately. Liz and her team worked extremely hard to provide the printed publicity in time for GFM to display them at The Black Workers Network Launch on 28 May 2002. Unfortunately, everyone did not respond in the same way. Telephones lines / numbers had not been sorted out while the refurbishment work was being done for each office, therefore there was no phone number on the printed publicity. There was also no broadband line to run the web casting while GFM was on and off air, despite requesting this facility 18 March 2002. Broadcasting on the Internet was the way we intended to continue serving the community with music, news, information and advice. This can be best described as a lot of stress and hard work before and after it was discovered on Sunday 30 June 2002 the studio and IT equipment had been stolen. Trying to work to our project plan was becoming very difficult with the continual uncertainty about the completion of the refurbishment work of conduit street and outcome of the bid for IT equipment. There was also two of our presenters that found work. One I heard was working in Faliraki, Greece and would not be back for the broadcast. And the other was working shifts, so he was not able to start on time or present all of his shows over the four-week period. Things were not getting any easier. None the less, we never gave up. The GFM family rallied round, Ian Palmer, John Mustoe and Carlos Docksey agreed to present the Lunchtime and Drivetime Show’s. Thanks guys. On 12 June we eventually received confirmation from the Barton, Tredworth and Eastgate Community Trust the funds were available from the bid to purchase the IT Equipment, it took a week to sort out ordering the IT equipment. The studio and Transmitter equipment was due to be delivered and installed Thursday 27 June. We would now not have enough time to load all the various type of music, jingles and receive training on the use of the new IT equipment from the supplier and have it in place for the IT equipment to be connected to the studio equipment. The 12 June was also the day I was informed the area we would be broadcasting from would be ready for the installation of the equipment but there might still be some works being finished in the centre. I naturally assumed that the area we would be housing the equipment in would be alarmed. Everyone involved as far as I’m aware put enormous pressure on the builders to ensure the equipment could be installed in the centre on 27 June and in time for the external training to commence on Monday 1 July 2002. Most of the equipment was installed Thursday 27 June. The transmitter and link system was not connected or in the building. GFM was renting this equipment to enable the broadcast to take place, because not enough funds had been secured to purchase it. I spent most of Friday 28 June chasing up old and new insurance companies to get cover for the equipment. One of our partners in the previous two broadcasts Barton and Tredworth Development Ltd were able to insure the hired equipment for us as their way of supporting GFM. Unfortunately this was not possible this year due to the refurbishment at the Trust Centre and the change of ownership. The Barton Tredworth and Eastgate community Trust is now the new owners of the Trust Centre. However, the Trust could not insure the equipment. However, always at the back of my mind was the fact the insurance cover would be invalid if the alarm system were not operational. I was still hopeful the alarm would be sorted before the weekend, when the building would we unattended until Monday 1 July. On Sunday 30 June around 3.30 in the afternoon, Dermain Bachelor and John Mustoe assisted me to bring ten tables and twenty five chairs that we had hired from the Colwell Centre, Derby Road, Gloucester to the Trust Centre, to prepare for the external training to be delivered by Kevin Philemon from CEED Multi Media Centre, Bristol. Training was to commence Monday 1 July. Once we had put the tables and chairs in the proposed IT centre, I said to Dermain and John to come with me and I’ll show you the studio. When I went to unlock the door I saw through the glass panel in the door that the microphone was on the floor, I then noticed the door had been forced, I pushed the door open and went into the room, the equipment was gone. I was lost for words, how could people do this to the community. I was devastated. Training was due to start Monday, what were we going to do. I called the police, the officers who came expressed an opinion that only the people working in the building would know the equipment was there apart from us. Whilst the police were on site it was discovered the building was broken into via a back door that seemed quite secure. The door was locked a bolt fixed on the inside, a piece of ply wood panel screwed to the frame and another bolt fixed to the frame, that covered the whole door. On Monday morning Carol met the training team from Bristol and the eighteen people that were booked in to do the training. The five – day training course went ahead as planned, even though there were no equipment to do practical training on. Some of the presenters rallied around and were able to muster a few bits and pieces to do some practical training. Everyone who attended has given us very good feedback, they will all receive an open college network certificate. Unfortunately, because the equipment was stolen we had to cancel the week – long internal training on use of the studio and IT equipment planned to commence Monday July 8. Derek Tallent, from Soundsense visited us on Tuesday 2 July to assess the situation, he was prepared to hire GFM replacement equipment to enable the broadcast to go ahead, despite what had happened as long as we could provide him with written proof of our insurance documents. We received pledges of financial support as well as the use of some IT equipment. We had managed to raise sufficient funds to hire the equipment we needed and pay for insurance. This ensured we could get on air on Monday 15 July as intended. The Citizen newspaper gave the theft a lot of good publicity in the hope the equipment would be recovered. I was also interviewed by Evadney Campbell MBE from BBC Radio Gloucester on 7 July. The interview was to highlight what had happened and to appeal for the equipment to be brought back and to ask if any one knows anything to contact either GFM or the police. Getting the insurance cover required was to prove the most difficult task both, Tony and I had undertaken since being involved with GFM. Tony and I tried so many brokers / insurance companies with out success, I can’t even remember how many, even our bank was not able to point us in the right direction. On Tuesday 9 July we finally secured the insurance for equipment and public liability cover required. A security guard had also been put on site and the alarm system was completed to the upstairs part of the Trust Centre where we would be broadcasting. I must say a big thank you to Jonathan Magee for sorting this out. I received written confirmation 10 July I then faxed a copy of the cover note to Sondsense, and arrangements were made to install the equipment on Thursday 11 July Soundsense is based in Telford, Shropshire. Most of the equipment was installed but for reason unknown not all the equipment was loaded into the van, this meant we were not able to test it properly. This was three days before the broadcast, we had to get as many people as possible to get some training on the use of the broadcasting desk and the IT equipment before going live to the community Monday 15 July. With all that had happened and not being able to provide as much training as we had planned we decided to use the IT equipment and software used last year. At least we knew most of the presenters had used it before, we could try and make sure as many of the new presenters received training in the order they would present their shows. We were not able to check the equipment properly until the morning of Saturday 13 July, when we received the speakers and microphone from soundsense. We also never had any record decks following the theft, but John Mustoe came to our rescue by providing some replacements for presenters to use and Pete Mizzi put new cartridge and stylus on them, thanks guys. Then guess what, there were problems with the equipment when the microphone was used. We were so near now, we were not going to give up. Martin Rafferty, JJ Watkins and Jerry Hipkiss worked extremely hard to try and train as many people as possible on Saturday 13 and Sunday 14 July, whilst carrying out repairs to the equipment in the studio it was getting hotter and hotter by the second. Thank you for the help and support guys. Sunday night was an eventful night, I turned on the receiver and telephoned Martin for a signal check in Quedgeley, when Martin said there was no signal my heart sank. We talked it through and concluded some one must have turned off the transmitter. I left the studio and travelled to the transmitter site and low and behold someone had turned it off. I switched it on and travelled back to the studio, I then received the phone call I was hoping for, I played a CD and then Martin joined me in the studio and took control of playing the music. I called family, friends and as many presenters as possible to confirm the sound quality, they all confirmed GFM was on air loud and clear. Unfortunately we were broadcasting in mono and not stereo. This had to rectified as soon as possible. On Monday 15 July 2002 at 7.00am Jerry Hipkiss went live to our multi cultural community with the Breakfast Show. I hoped that whatever minor problems there might be it could be sorted out fairly quickly while we’re on air. How wrong could I be, Ian Palmer had travelled down from Swansea to present the Lunchtime Show, Ian moved away from Gloucester after the last broadcast, but wanted to be involved even if it was only for a week. He had not seen the equipment before entering the studio, to encounter problems with the computer playing the adverts, the text line and the studio gradually getting hotter and hotter would have wound most people up. Ian remained calm as usual. Carlos followed Ian Palmer, with the Drivetime Show the problems continued, to make matters worst Carlos was not very well, but again he stuck with it to serve our community. By the time the community link show was due to go live things had settled down a bit, but the studio had become so hot it was like being in a sauna. The problems with the IT equipment and the texline facility was to become a noose around our neck. Unfortunately, we were not able to collate the number of tex messages we received. We know we received an enormous amount but we just can’t prove it. We did not have a telephone line until two days into the broadcast, we then found the phone supplied by Soundsense would not flash all the time when it was ringing, therefore we could not be sure how many calls were received in the studio. All the new presenters did extremely well, given they received little or no training on the use of the studio equipment before going live on air. It was pleasing that some of our experienced presenters supported the new presenters when they could. I must say a big thank you to Carlos Docksey for trying to fix our CD players at 12.00 am in the morning. And then loaning us his own CD players when ours broke down to ensure Jerry could present the Breakfast Show and for other presenters to use until the replacement arrived the following day. In general we the committee are reasonably happy with the delivery of the service considering the problems we encountered. We are again pleased that the community has voiced their opinion on the broadcast, this will help us to continue to develop GFM in the future. This broadcast highlighted so many things to us the committee, we learnt an invaluable lesson about partnership, we’ve gained some and we’ve lost some. The biggest gain for us was the response from the community, when the news broke the equipment had been stolen, the community gave us so much encouragement and support we cannot thank them enough, we will continue do our very best to deliver more broadcasts for our community. Unfortunately, GFM took a positive step forward but the theft of the equipment forced us to take more than two step backwards. The raising of the funds required to purchase the studio and IT equipment was exhaustive and at time very frustrating. The cost of replacing the equipment and the cost of license fees to run another broadcast is appropriately £35.000.00. We will once again embark on raising the funds required, we’re hopeful large local business / organisations will work in partnership with GFM and provide financial support to enable us to continue to provide training and entertainment to our Multi Cultural community. Only time will tell if GFM will broadcast to coincide with next years Gloucester City Festival. We must engage someone who is going to seek funds and actively promote Gloucester FM to local business. A studio engineer to be on hand to provide technical help and guidance whenever necessary, our supplier is too far away when there is a crisis, and someone to be dedicated with the responsibly of maintaining the IT equipment. These areas along with raising funds for more broadcasts are our main objectives. The running of GFM has become a full time job, therefore we must find the right people to join the GFM family to fulfil the roles mentioned. I will again make contact with Glos Cat to attempt to find students who want to get hands on training which will help them in their future career development. I’m hopeful with there being a university in Gloucester now, I might get a response from Glos Cat regarding our proposals. It is imperative we widen the choice of music of black origin being played on GFM to enable us to interact with even more of our community. The community has indicated we should consider this, therefore we will actively encourage people to come forward to help GFM serve more of the community by helping to deliver the music being requested, for example, Jazz, Blues African beats etc. For the month of July we had nearly 30,000 hits on the website (www.gfm.org.uk), this is another clear indication the community supports GFM. Our end of summer broadcast party brought together a wide cross section of our multi cultural community. We at GFM believe we are a good example of equal opportunity with people from different nationalities involved with GFM, the enormous support at the party vindicated this. We are hoping to broadcast some of the programme contents on the Internet shortly and continue to provide the community with music, news, information and advice whilst we’re off air. Thus keeping in touch with the community who can also email us. Remember, ” GFM with the people for the people, serving the community”.